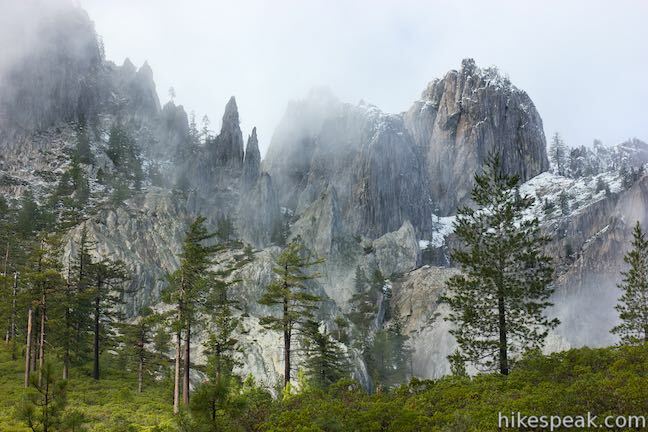 Spectacular granite peaks known as the Castle Crags tower over Castle Crags State Park in Northern California. 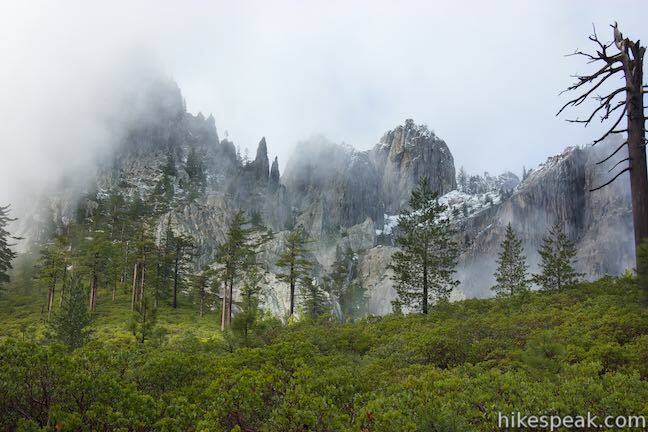 This dramatic enclave of peaks is largely inaccessible to hikers, but you’ll get a great taste of the Castle Crags on Crags Trail, which climbs to the foot of Castle Dome, a 4,996-foot granite dome that looks plucked from the Sierra. 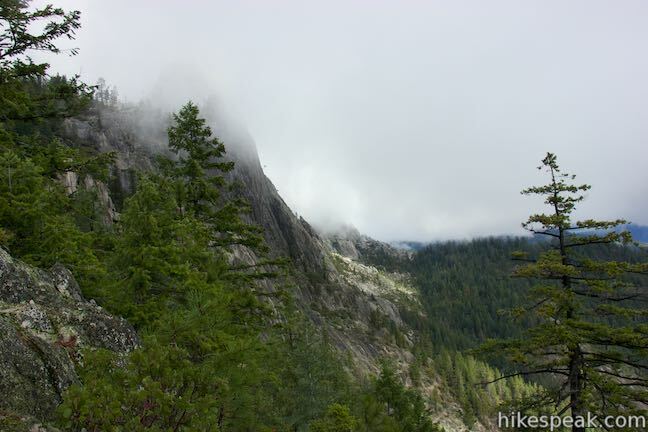 Although Crags Trail stops below the summit of Castle Dome, it gains 2,150 feet of elevation on a sincere ascent through a jungle of granite crags. 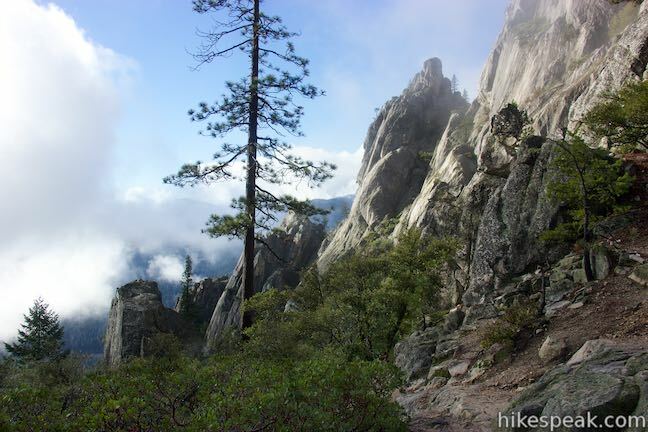 At trail’s end, you’ll get up close to Castle Dome and gaze upon a wild landscape of jagged peaks that rise even higher. 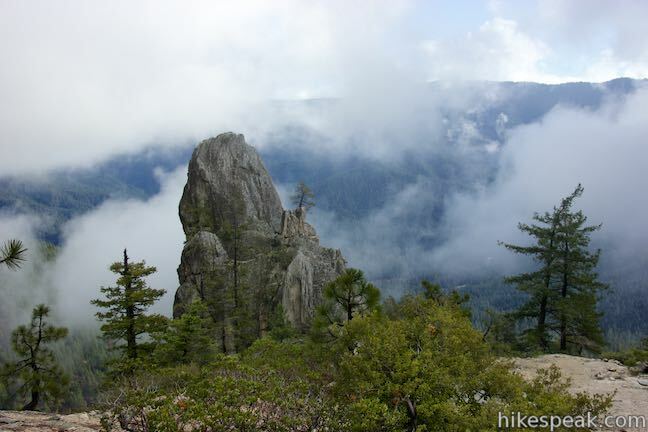 This hike up Crags Trail is 5.6 miles round trip and deserves to be extended to 6 miles round trip by incorporating a scenic spur to Indian Springs. 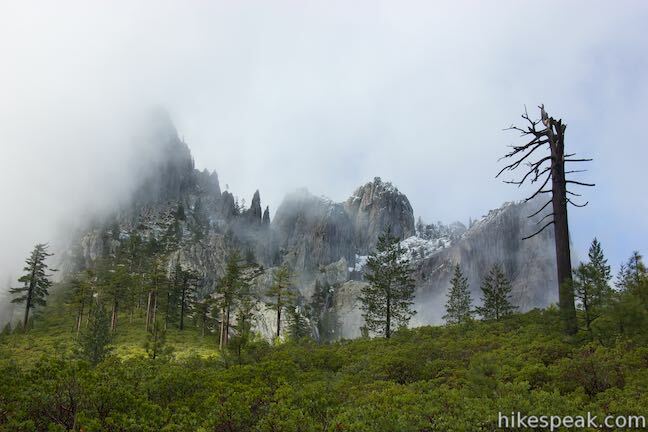 Crags Trail ends in Castle Crags Wilderness, an area of Shasta-Trinity National Forest, but it departs from Castle Crags State Park. 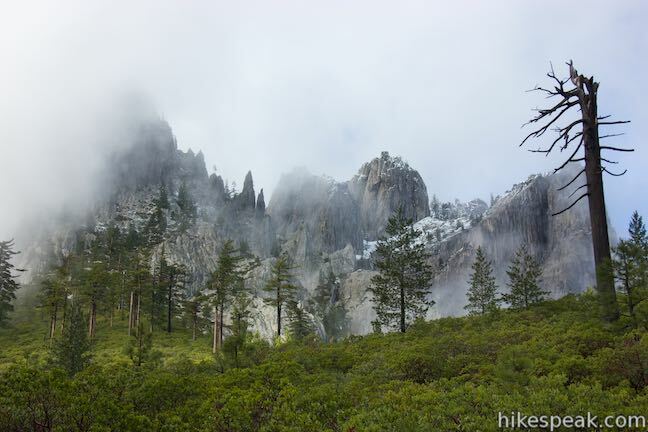 The hike begins near the top of Vista Point Road, and the nearby Vista Point Trail leads to a great view of the Castle Crags, allowing you to see what you’re getting into before starting this trek. 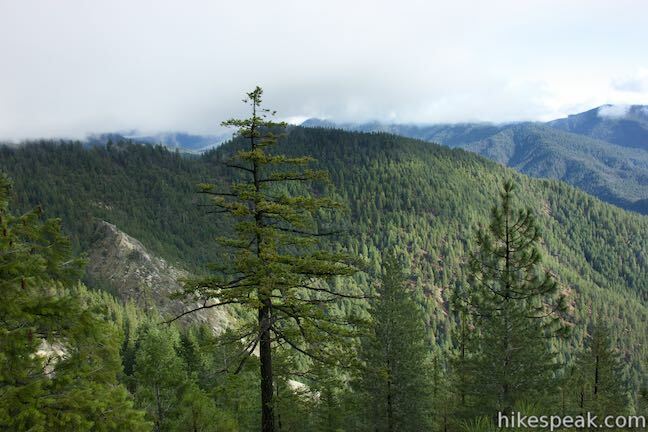 Walk away from Vista Point Trail and go a short distance back down the road to the trailhead on the right, marked with a sign for Crags Trail. 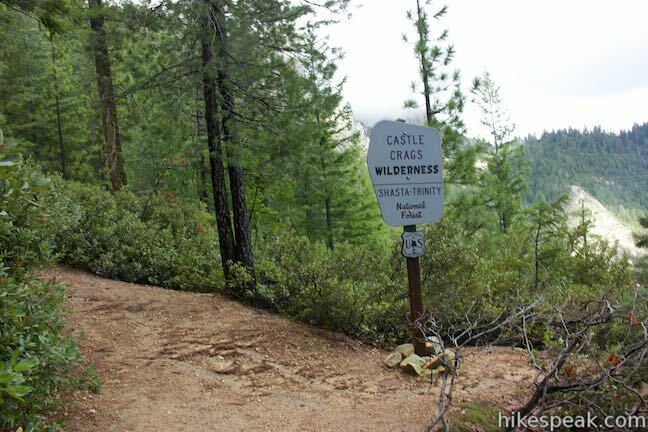 Although there is quite a ways to climb to reach Castle Dome, the start of this trail is quite gradual. 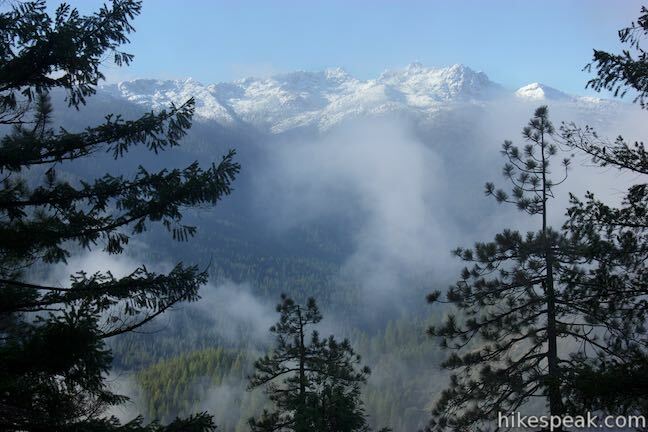 Enjoy an easy beginning as the trail aims northwest along the side of Kettlebelly Ridge. 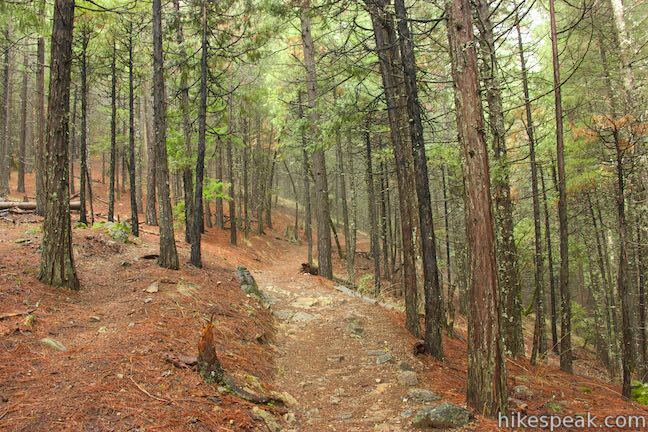 Tall pines surround the trail to provide lots of shade. After a quarter mile, you will come to a marked junction. 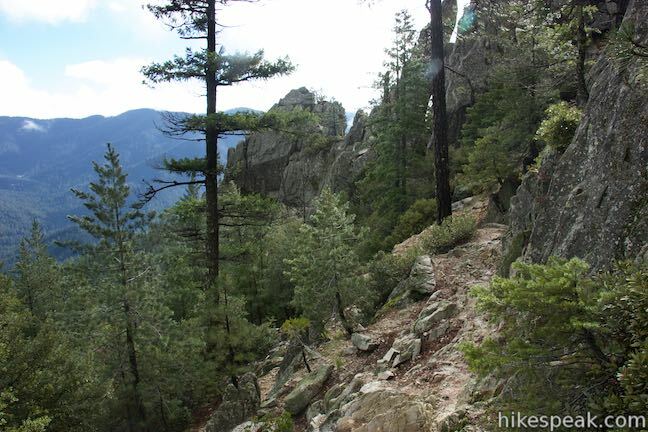 Crags Trail ascends to the left, while Root Creek Trail continues on a level course straight ahead. 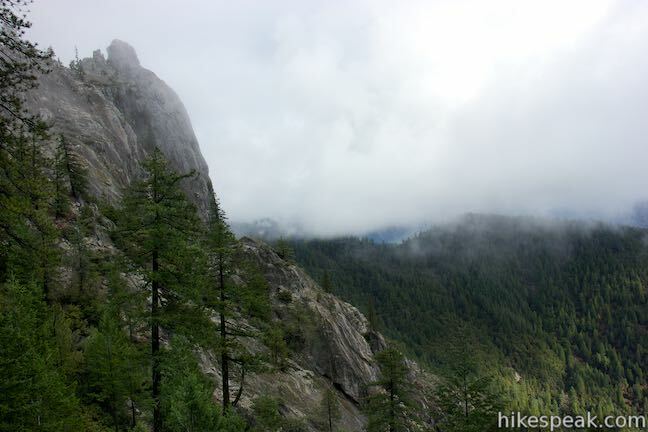 This is the end of the wheelchair-friendly portion of the hike, which is obvious immediately as you turn up Crags Trail and jump-start the ascent with a few quick switchbacks. 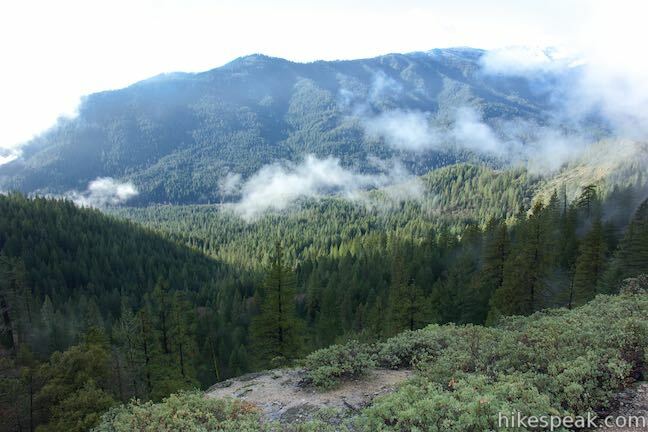 After another tenth of a mile, or 0.35 miles from the start, you will pass under a row of power lines and come to an intersection with Pacific Crest Trail. 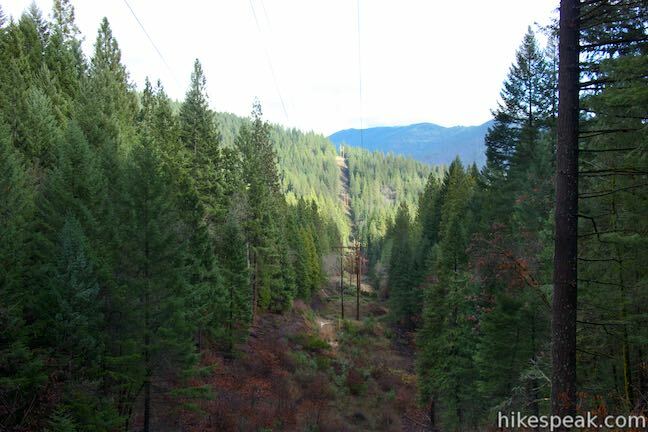 There is an open view to your right where the power lines drop down a hillside and cut a straight path through the forest. 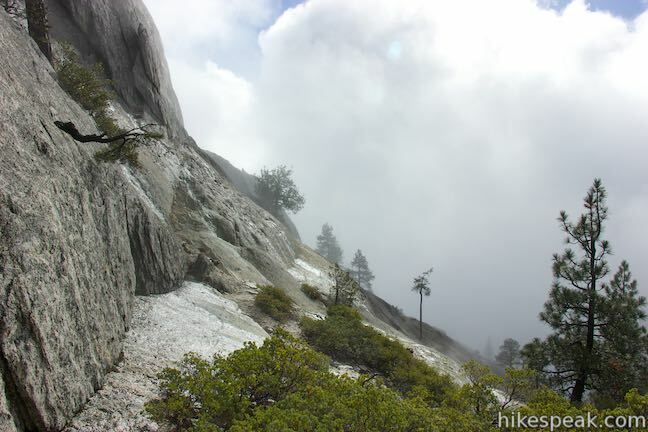 Cross through this junction with PCT and continue straight up Crags Trail. 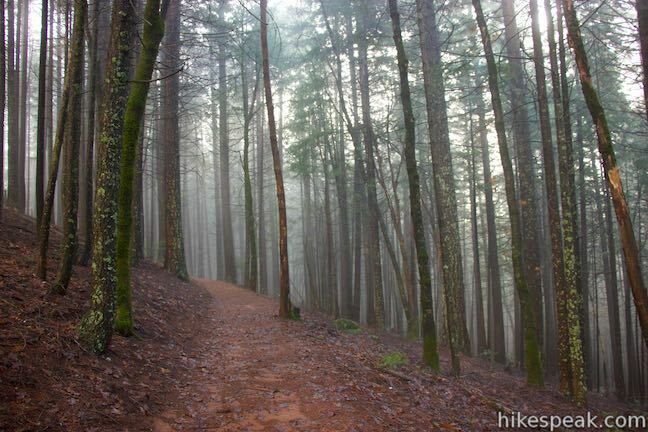 Crags Trail proceeds upward through a forest of pines. 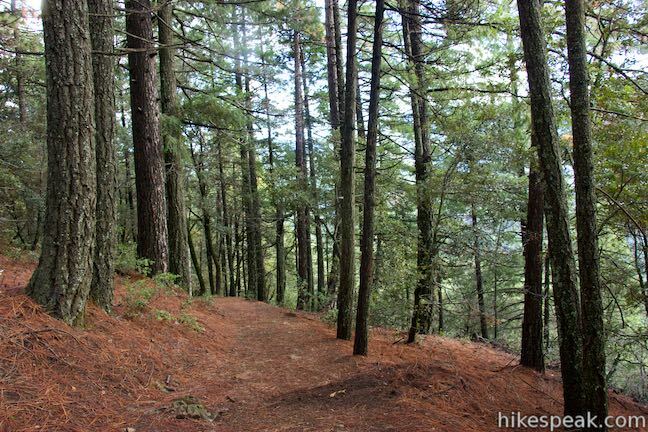 Strong sunlight can make its way between the tall trees, but you’ll enjoy fairly well shaded hiking along most of this trail. 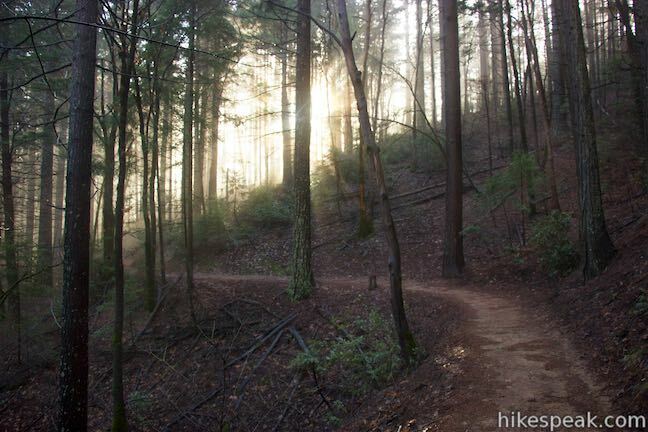 The wide single track follows the ridge to the northwest before making a sharp left bend to head west for a stretch. 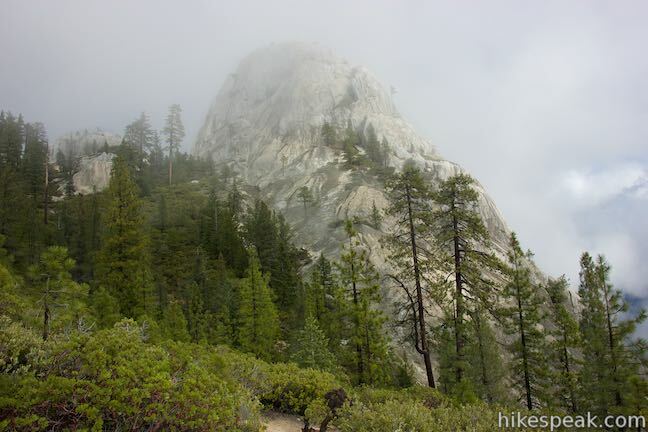 On this bearing, you will pass through a junction with Bob’s Hat Trail, 0.8 miles from the start, which descends to the left. 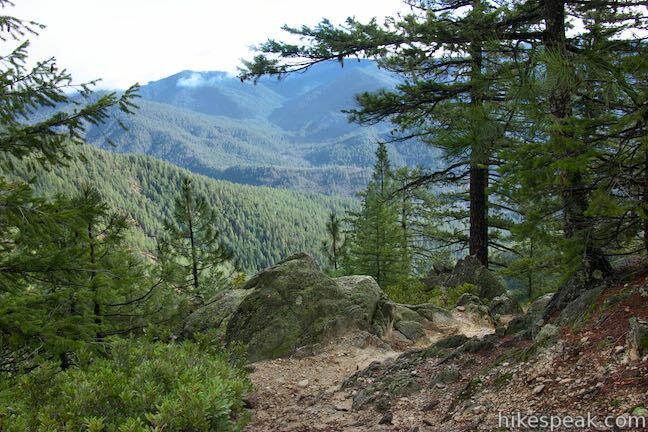 Continue up Crags Trail through more peaceful forest, gradually swinging back around to a northward trajectory. 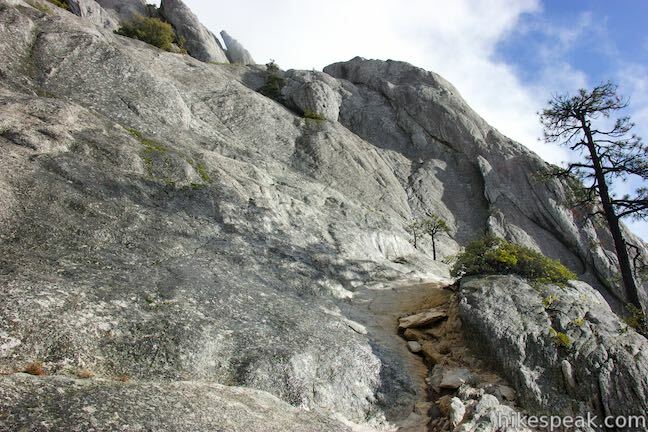 A big S-shaped couplet of curves brings the trail up to the top of the ridge where you will be happy to see things level out, if only temporarily. 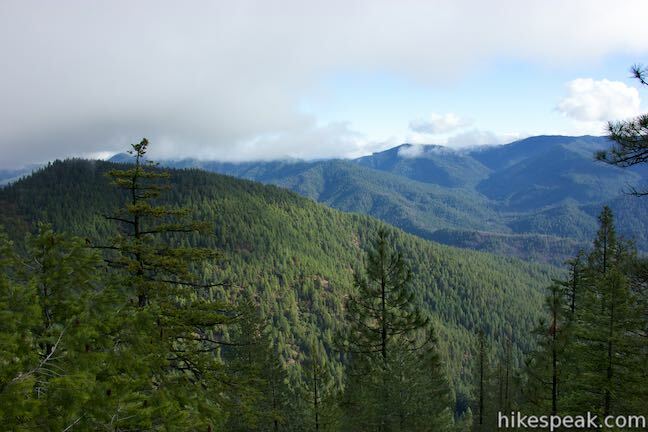 As you near a junction with Indian Springs Trail, Crags Trail crosses steeper slopes on the west side of the ridge that offer clear views across evergreen treetops toward the valley to the west. 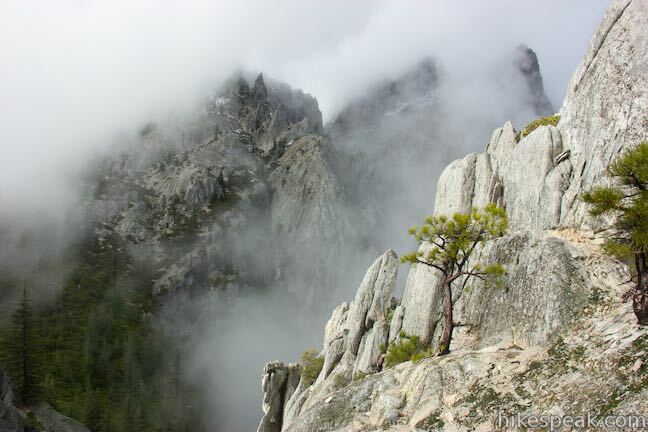 On the far side of this valley carved by Castle Creek there are conifer-covered ridges capped by the Gray Rocks, greenstone summits that get buried by snow during the winter months. 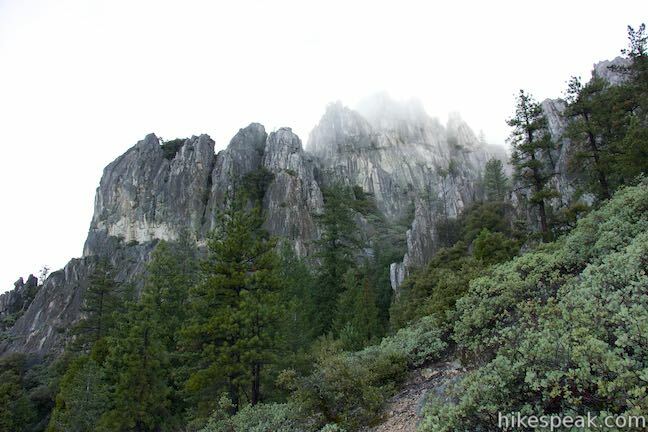 At 1.65 miles from the start, you will arrive at Indian Springs Junction. 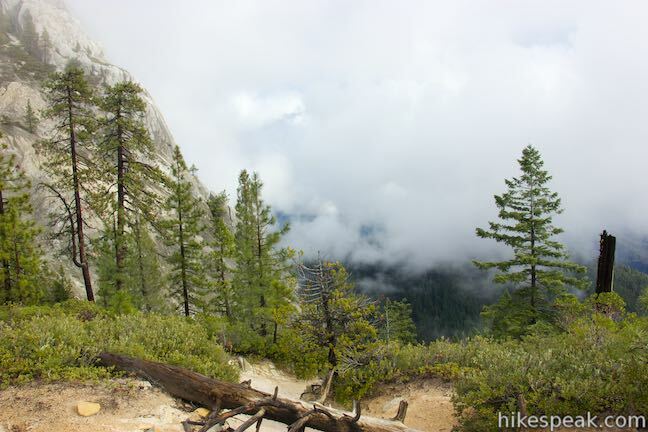 At this point, having ascended about 1,000 feet, you will be presented with a side trail to explore. 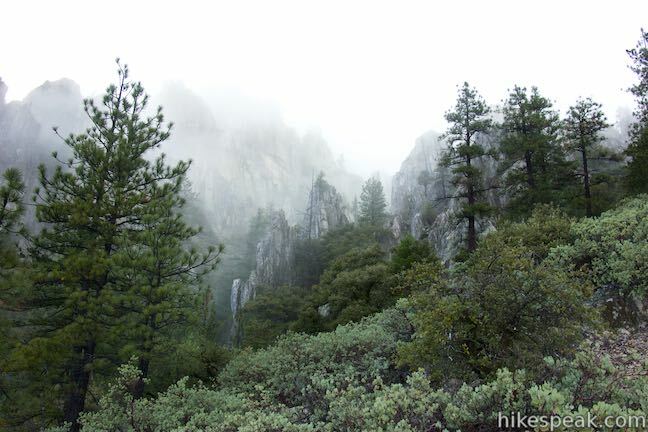 To the left, Indian Springs Trail makes a 0.2-mile long run out to a stream that flows out of the crags above. 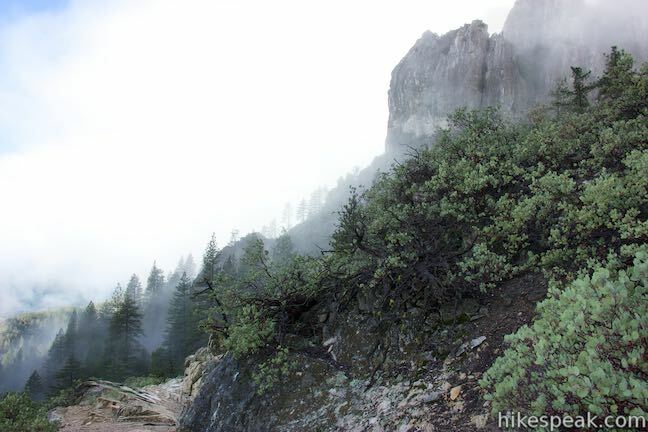 Indian Springs is not the only reason to check out this spur. 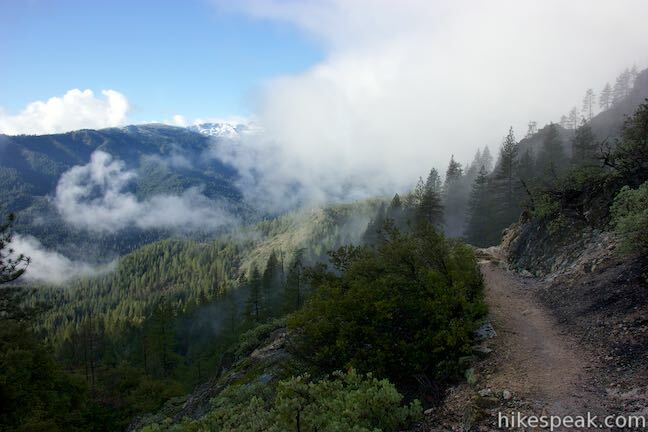 As you venture down Indian Springs Trail, it will exit the forest onto an exposed granite slope that offers an absolutely sweeping view over the valley below. 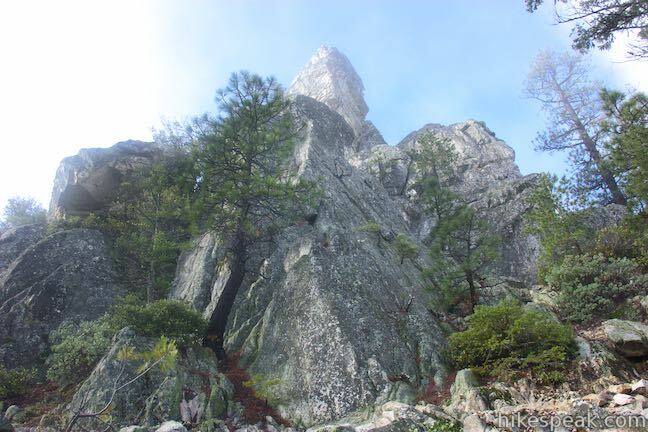 You’ll also be able to look up at jagged rock outcroppings just above the springs. 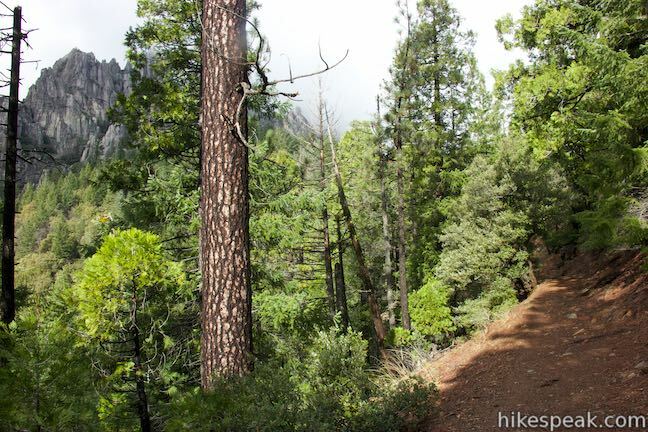 This middle section of the trail would be a great spot for a picnic, with views across Castle Creek Canyon toward the Gray Rocks in the Klamath Mountains. 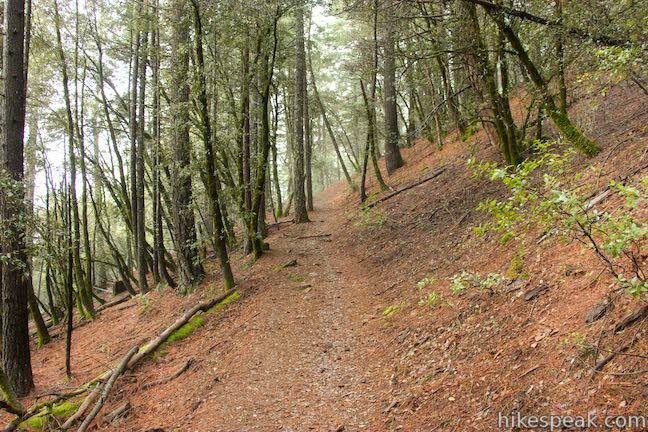 The trail drops back into the forest to reach Indian Springs. 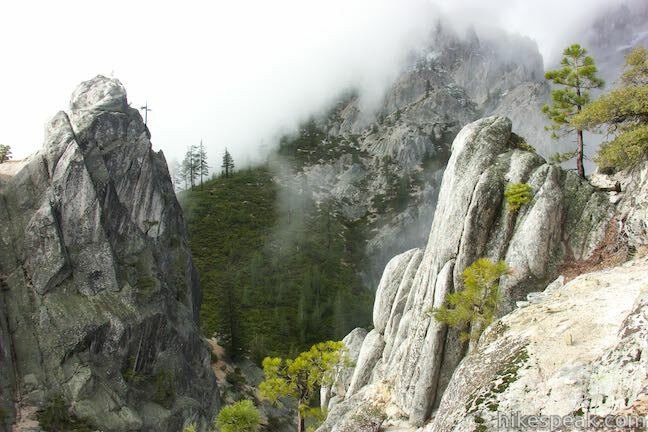 Water cascades around large boulders as the stream flows down the mountainside. 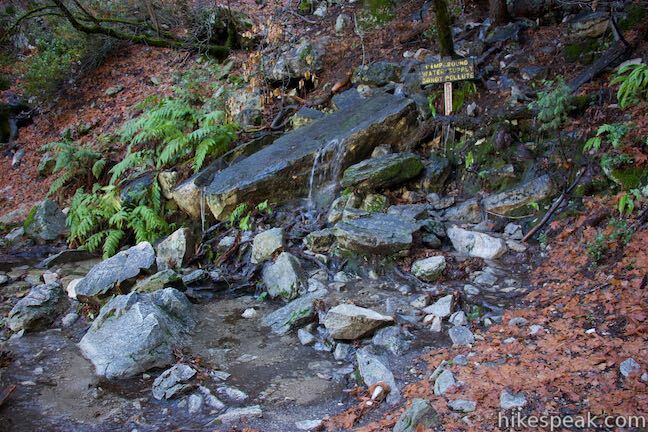 A sign indicates that Indian Springs provides water for the campground below, so don’t contaminate the source. 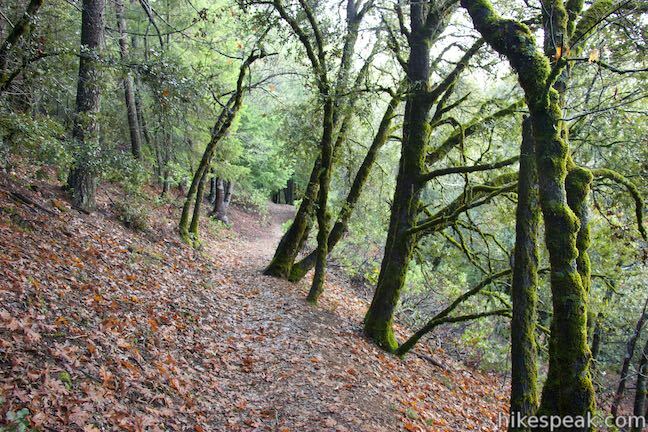 Head back to the junction after exploring Indian Springs. 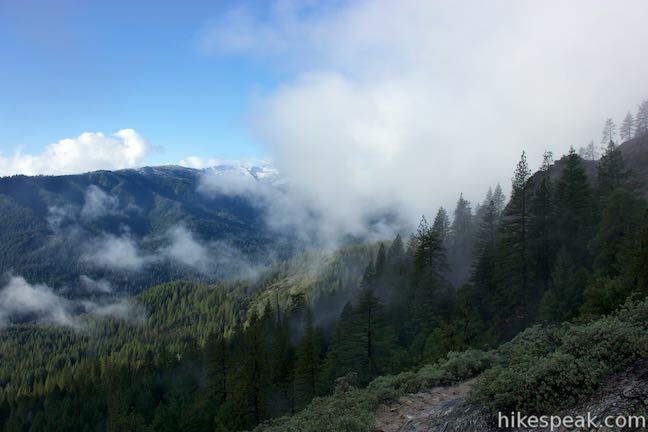 If you were to turn around here, it would be a 3.7-mile round trip hike with 1,000 feet of elevation gain. 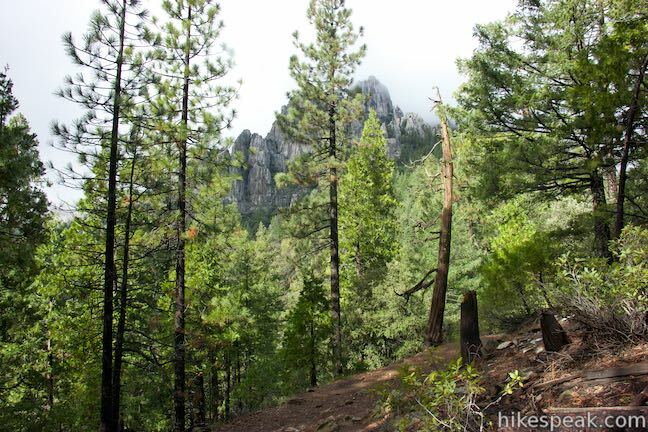 Otherwise, there is just over 2 miles left to hike with 1,150 feet of additional elevation gain to reach the top of Crags Trail. 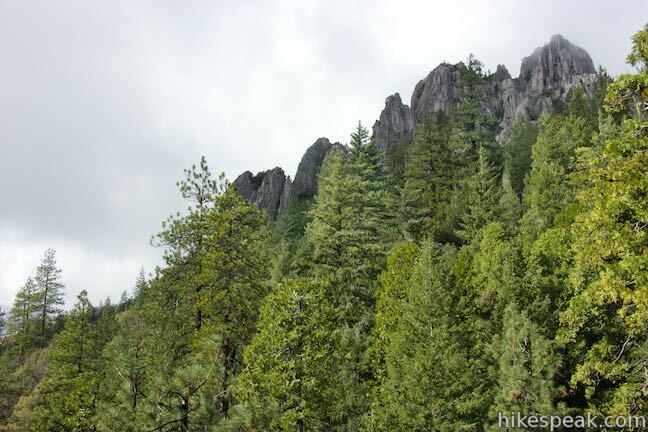 In another tenth of a mile, Crags Trail leaves Castle Crags State Park and enters Castle Crags Wilderness in Shasta-Trinity National Forest. There is a wooden sign marking the transition. 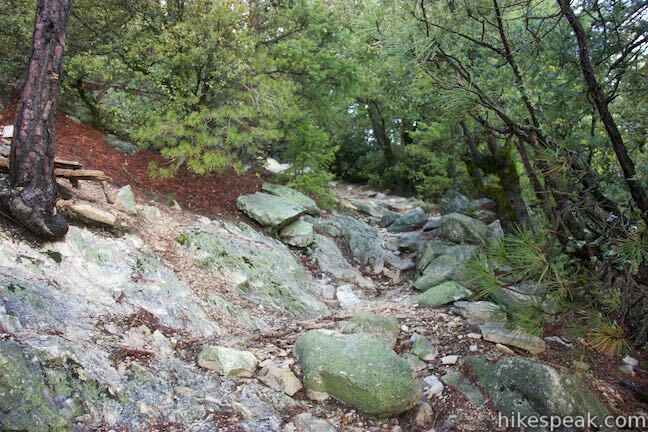 Crags Trail is very well maintained up until this point, but it becomes a little rougher within the wilderness area. 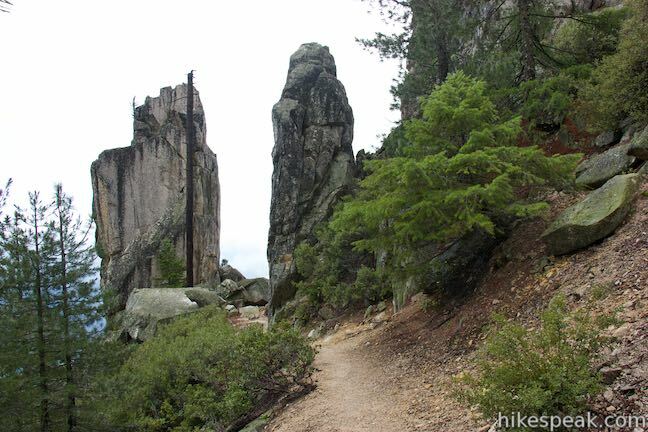 The trail also gets steeper and rockier not long after you pass into Castle Crags Wilderness and begin an exciting passage through a garden of granite. 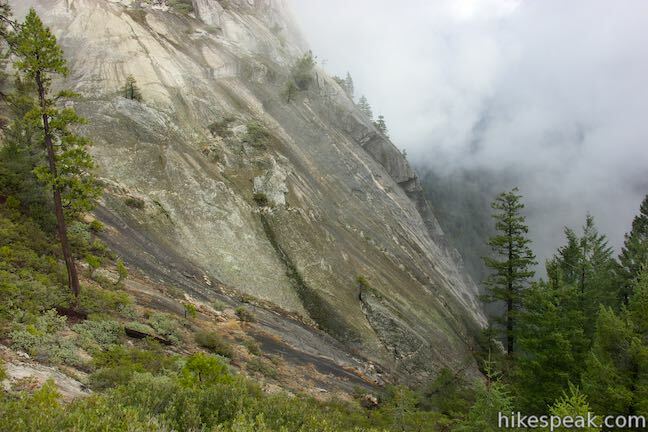 Monolithic cliffs and rock slabs jut out of the mountainside around the trail. 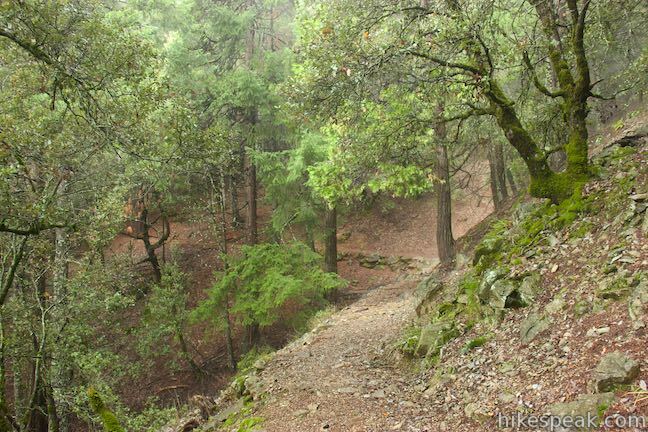 At 0.4 miles from the junction with Indian Springs Trail, you will hit a confusing part of the trail where the most obvious path heads to the left and quickly dead ends against a rock face. Bear right at this false junction to continue up Crags Trail. 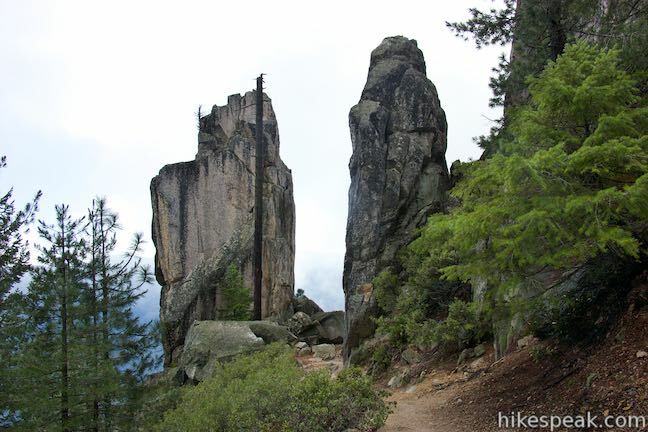 You will trek through lots of impressive rock formations, including a pair of rock pillars that stand like guardians along the trail. 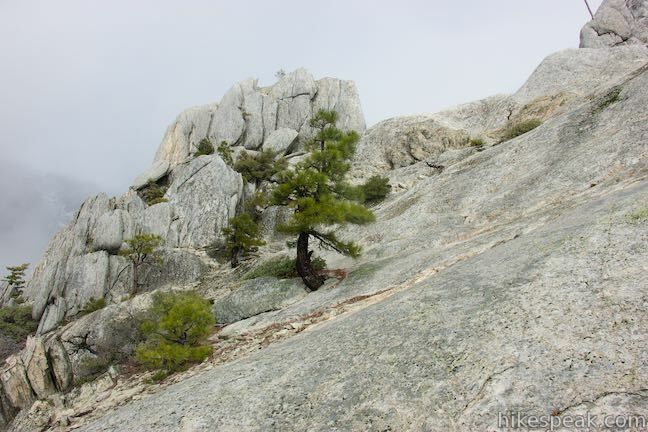 Eventually you will leave the rocks and get back to a dirt trail up an evergreen mountainside. 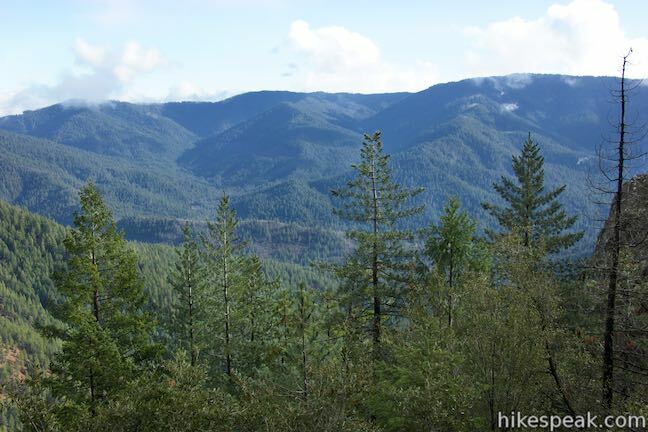 Enjoy views over the ridges and valleys to the northeast. 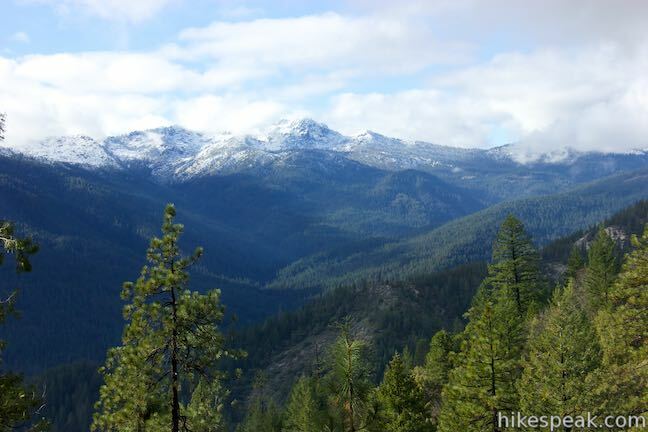 In clear conditions, Mount Shasta, the nearby 14,000-foot volcano, will be impossible to miss. 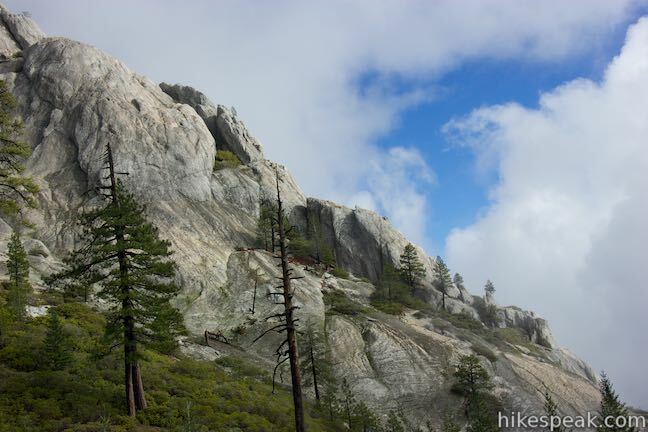 Pass a picturesque, lone-standing outcropping on the right as the trail bends to the left and begins the final push toward Castle Dome. 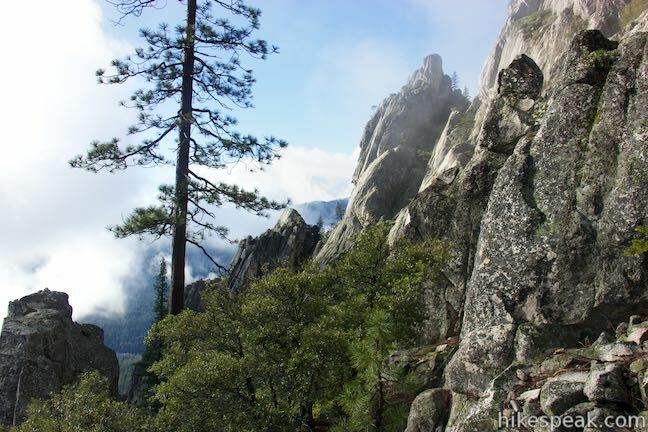 This tall granite dome gets larger and larger as the trail ascends a mountainside covered in low brush, Manzanita trees, and a few tall pines. 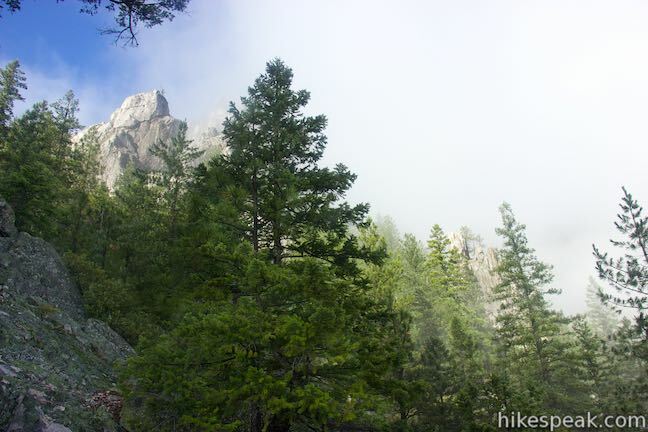 At 2.05 miles from the junction with Indian Springs Trail, Crags Trail comes to an unpronounced split (there may or may not be a post marking the end of the trail). 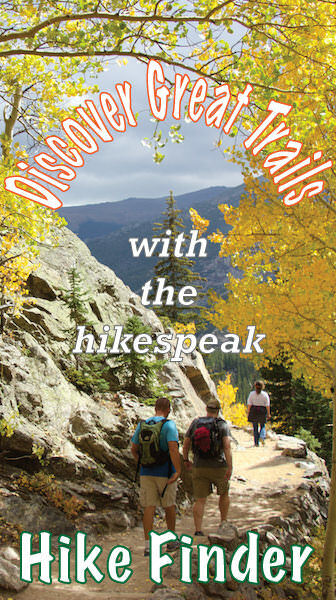 Paths heads off toward viewpoints in both directions. 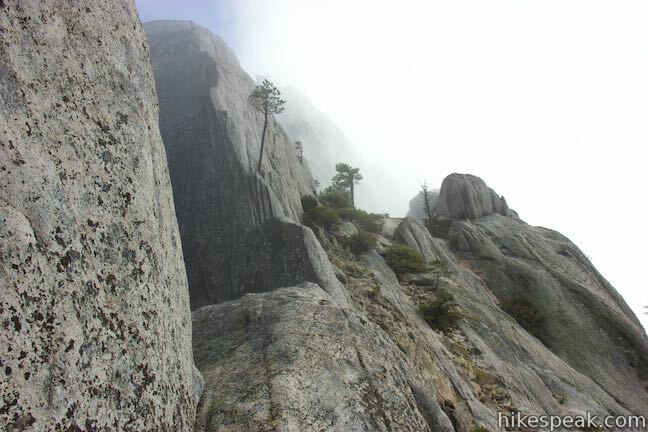 The most obvious route goes to the right a short distance to reach a notch below Castle Dome. 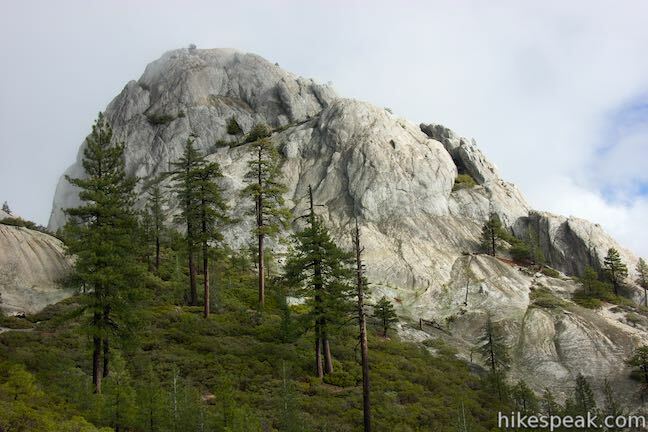 There is a boulder at the western base of Castle Dome that makes a nature bench. 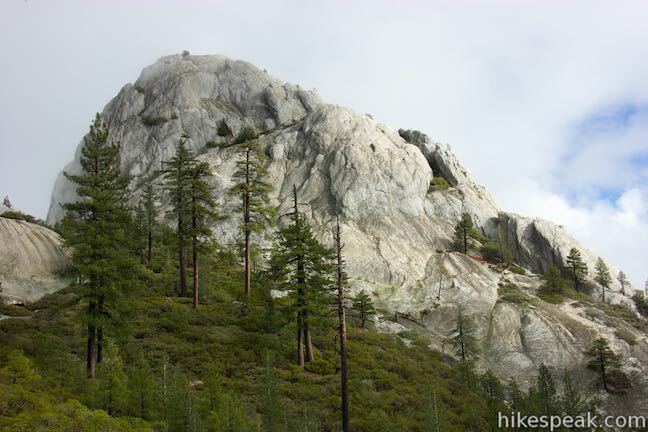 Have a seat and look up at the steep dome, which rises up another 300 feet. 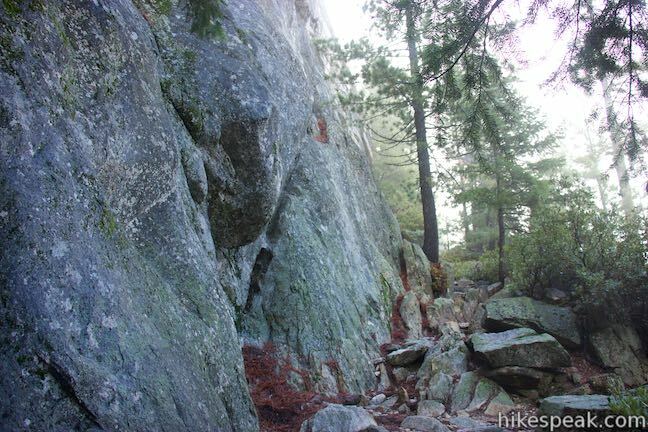 It appears like you could walk up part of the rock face on the south side, which is the least sheer. Don’t attempt this if conditions are wet or icy. 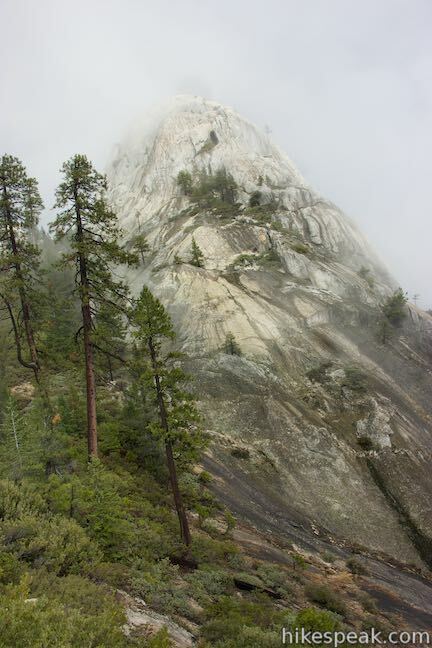 Due to the dangerous drop-offs, climbing to the top of Castle Dome should probably be left to professional climbers. 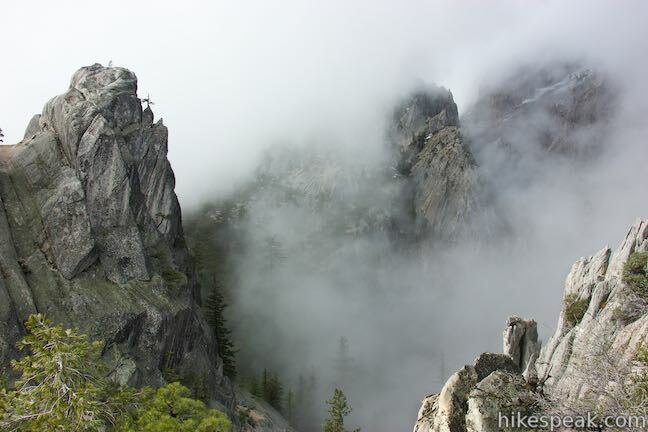 West of Castle Dome is a rugged and beautiful landscape of pointy crags and granite cliffs that will draw you in for a closer look. Back at the split at the end of Crags Trail, another path goes to the left that leads to a dramatic view of these mountains. 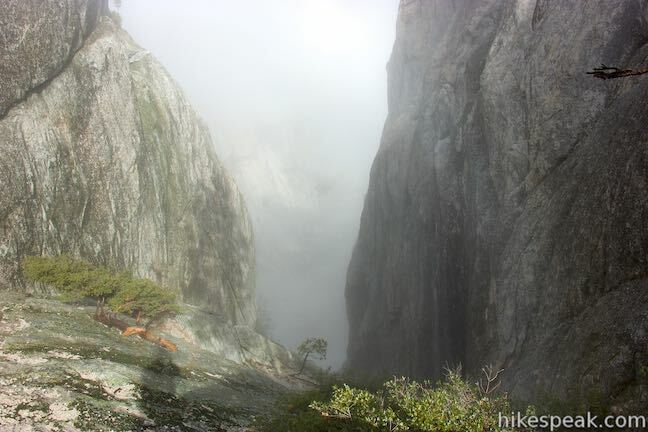 After about 300 feet, you will reach a landing at the edge of a canyon to the northwest. 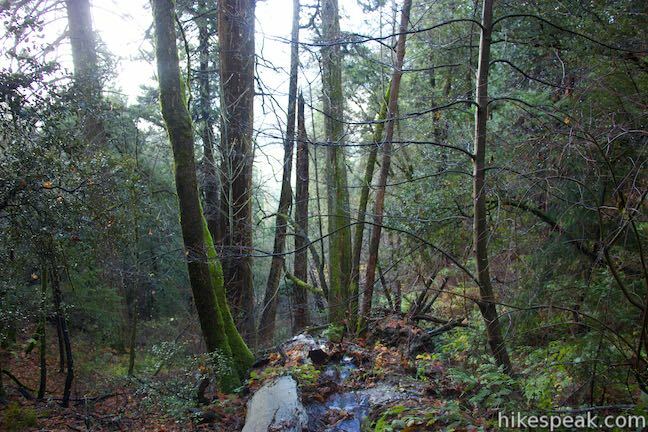 If you hear water trickling below, that is the upper reaches of Root Creek. 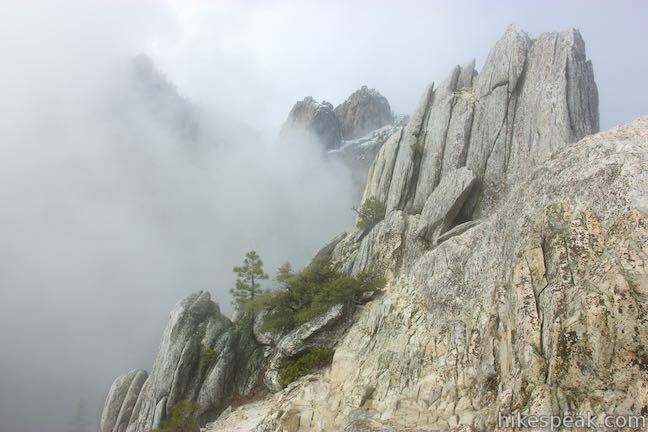 The perch is shaped a bit like an amphitheater that faces rugged, steeple-like crags that rise out of the mountainside. 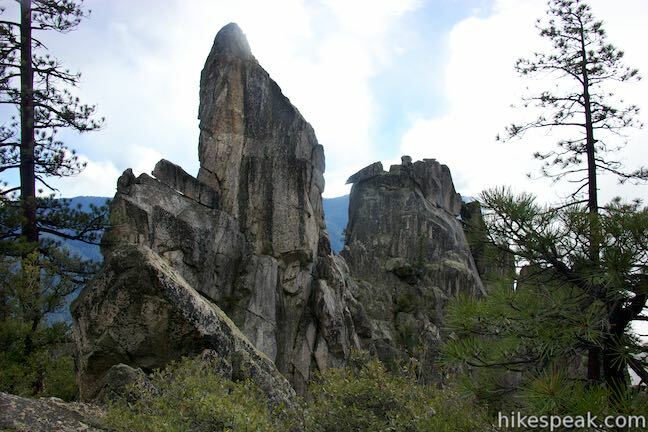 In the wintertime, snow collects around these dramatic pinnacles. 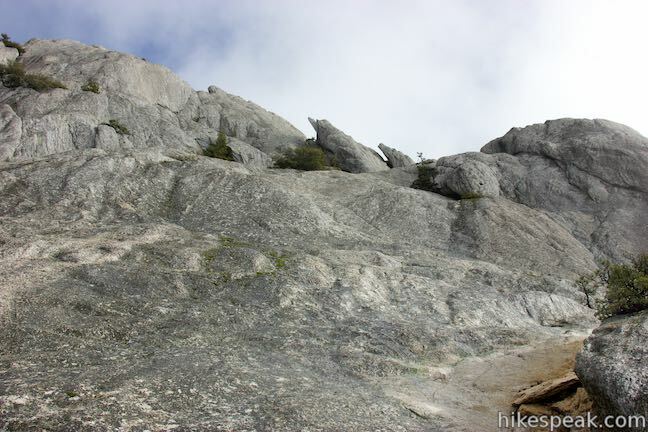 For a little thrill, you can venture up the short rocky slope to the right where you’ll spot a ledge at a gap in the rocks. 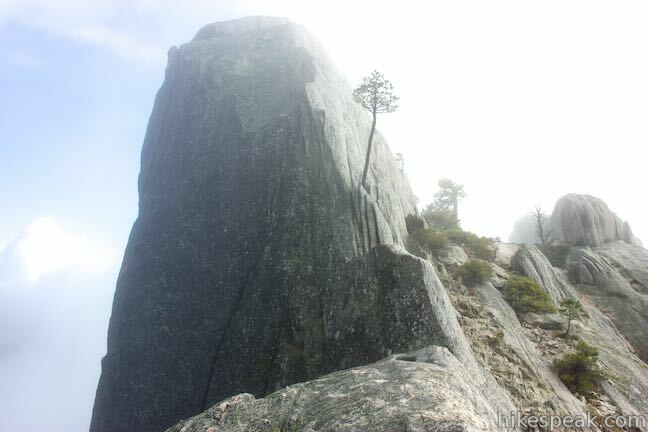 Carefully approach this ledge (if you choose to) and peer north over more evergreen peaks and valleys. 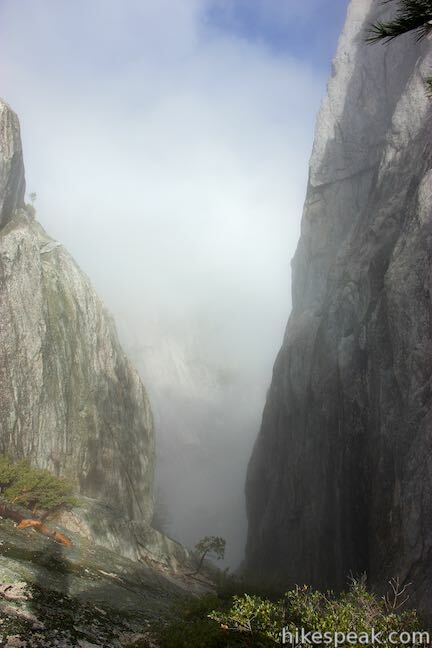 On the opposite side of this narrow rock landing there is a long, dangerous drop, so be cautious if you climb up to grab this perspective. 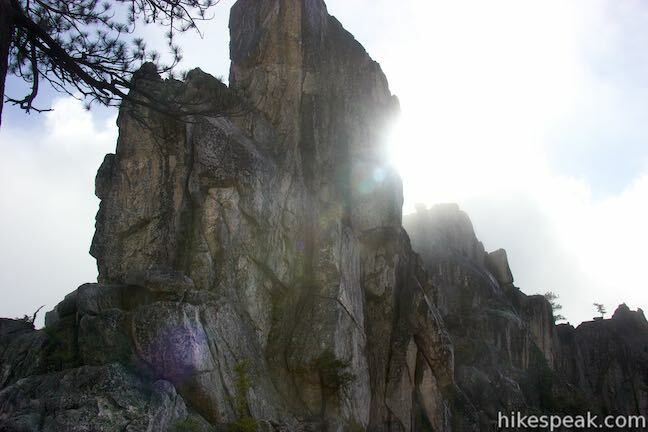 With or without it, you’ll be blown away by the Castle Crags. 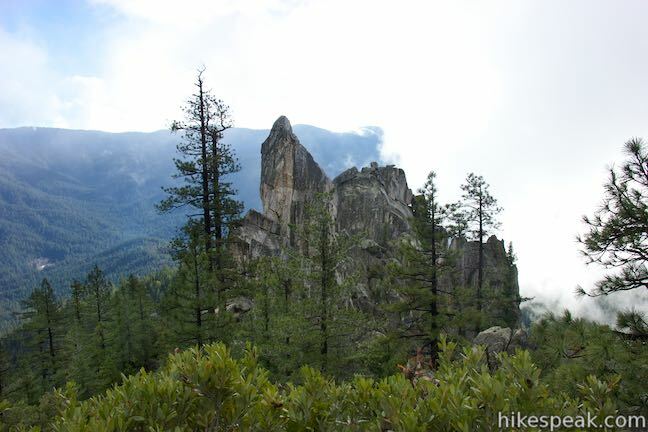 After exploring the two views off the end of Crags Trail, hike back down the trail to Vista Point Road. 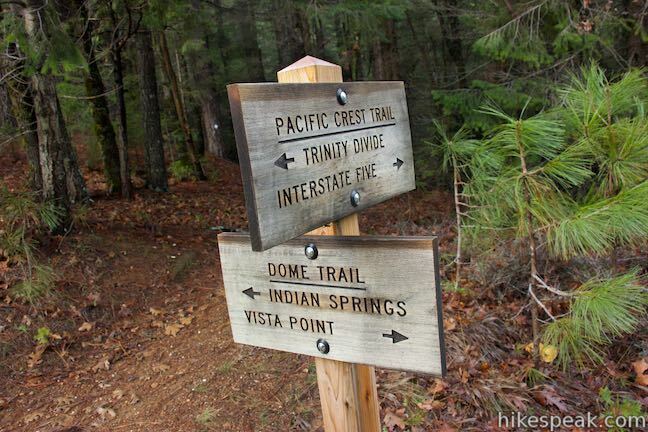 The round trip distance is 5.6 miles without Indian Springs and 6 miles with that worthy diversion included. 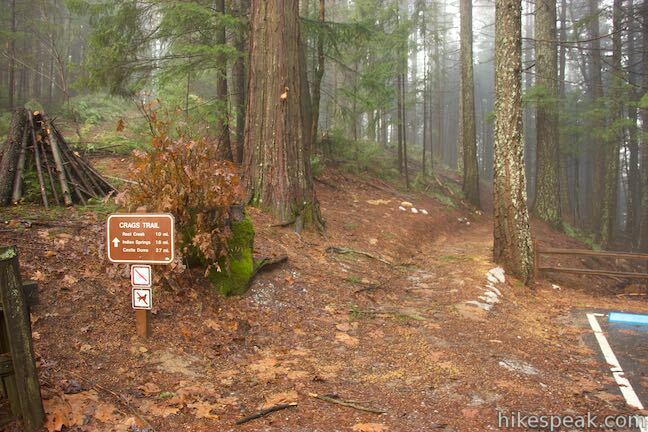 Dogs and bikes are not allowed on Crags Trail. 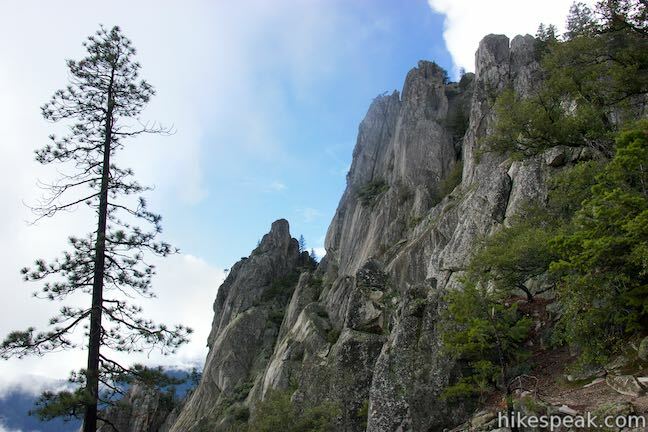 Castle Crags State Park has an entrance fee ($10 as of 2015) but no permit is required to hike Crags Trail, so get out and enjoy! 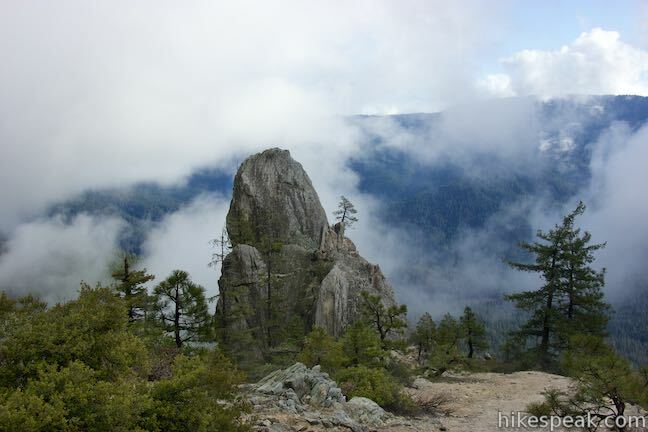 For more hiking in the park, check out Root Creek Trail and Vista Point Trail. 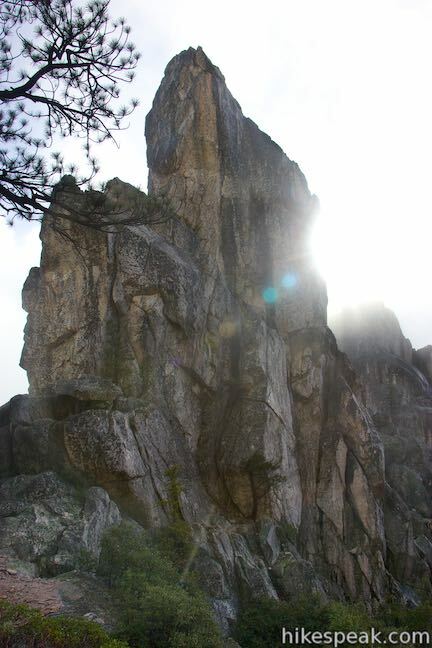 Camping in Castle Crags State Park is also available. 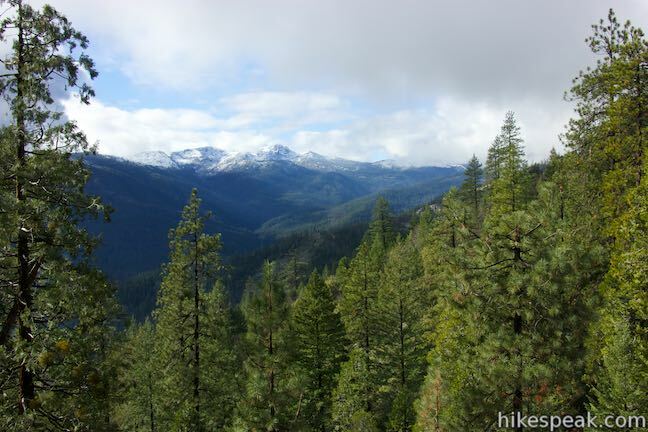 To get to the trailhead: Take Interstate 5 to exit 724 in Castella (located 14 miles south of Mount Shasta City and 44 miles north of Redding). At the bottom of the offramp, turn northwest onto Castle Creek Road. Drive 0.3 miles and turn right into the park entrance. 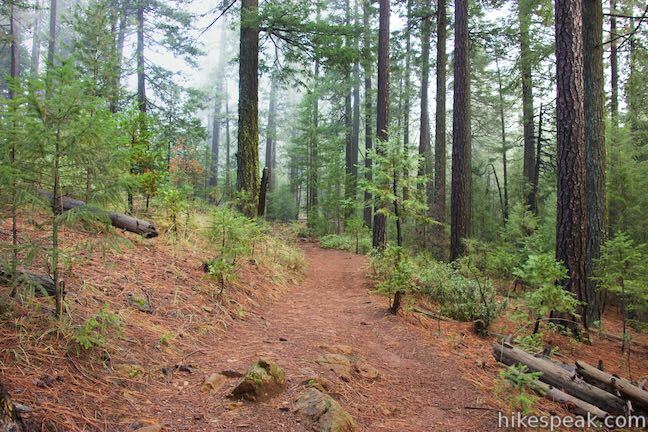 Inside the park, bear right and drive almost two miles up Vista Point Road to the parking area at the road’s end. 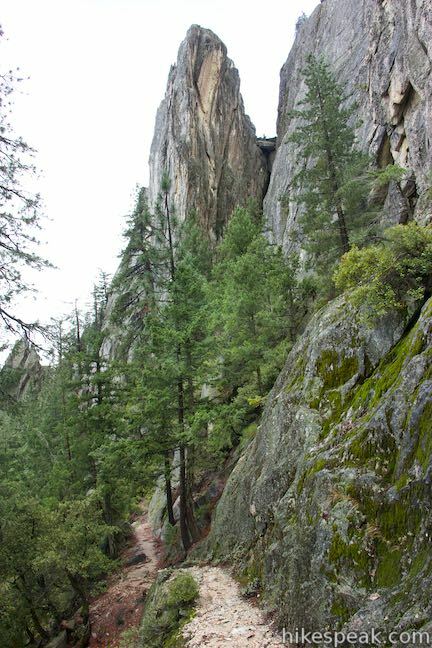 This road goes through the campground in Castle Crags State Park before heading up Kettlebelly Ridge. 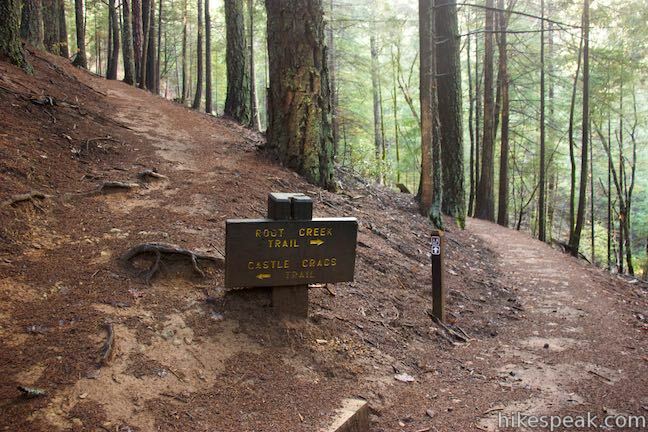 You will pass the start of Crags Trail just before reaching the parking area at the top of Vista Point Road. 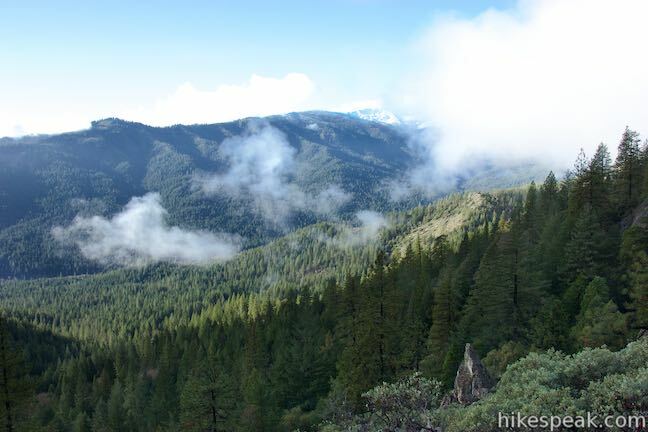 Or view a regional map of surrounding Northern California trails and campgrounds. 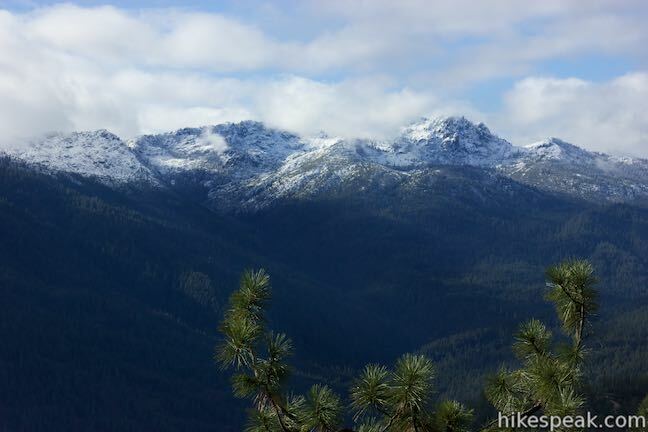 These photos were taken in December of 2014. Click to enlarge. 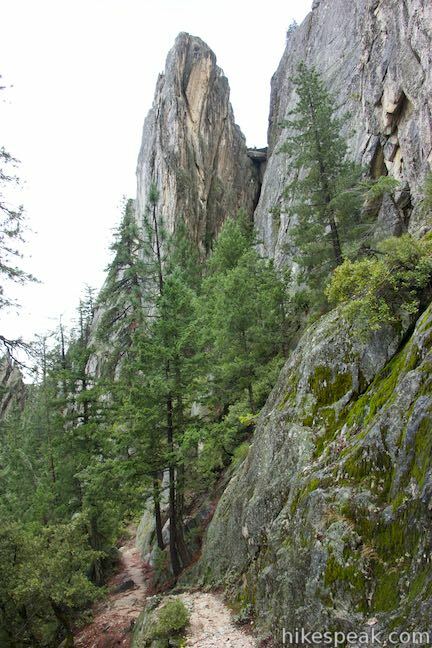 This 2.2-mile round trip hike in Castle Crags State Park takes a level and easy course to a tumbling creek in a mossy forest. 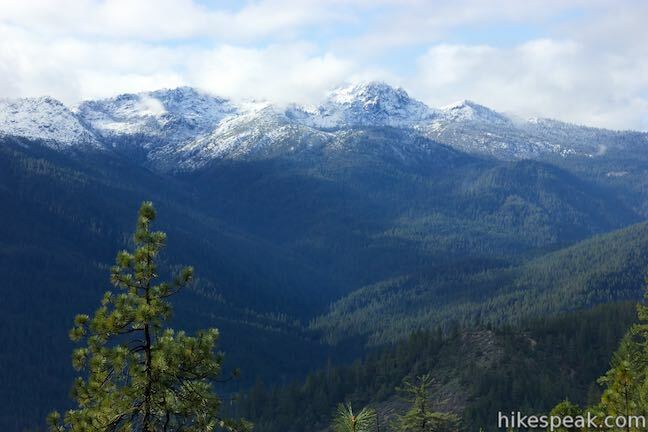 This short hike reaches the principal viewpoint in Castle Crags State Park, which has a great perspective of granite peaks known as the Castle Crags, along with views of Mount Shasta and the surrounding wilderness. 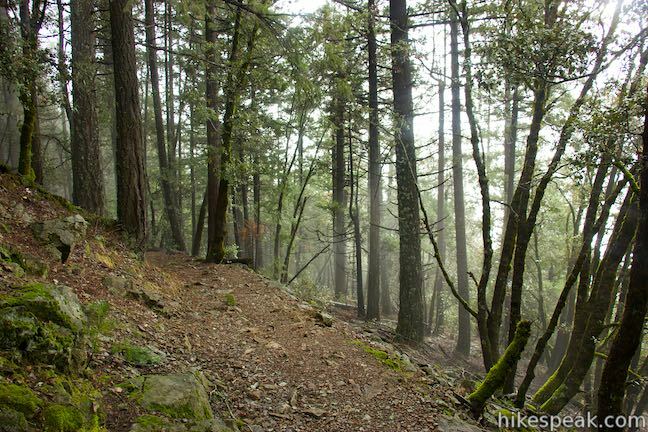 This easy 3.1-mile loop circles a hill-covered peninsula on the McCloud Arm of Shasta Lake, providing both lake views and shade. 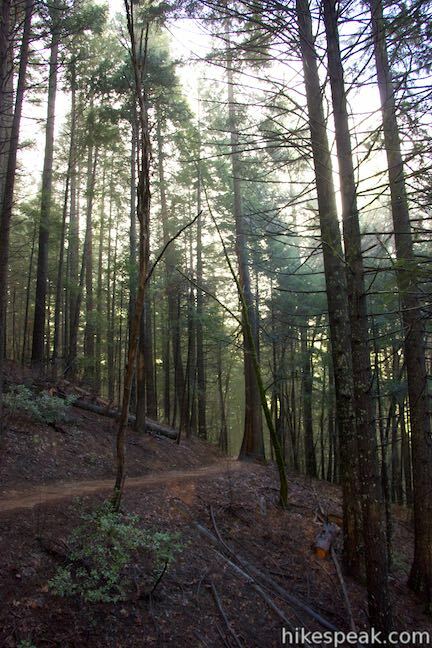 Explore more trails in Northern California, including redwood grove and oceanfront parks along the North Coast. 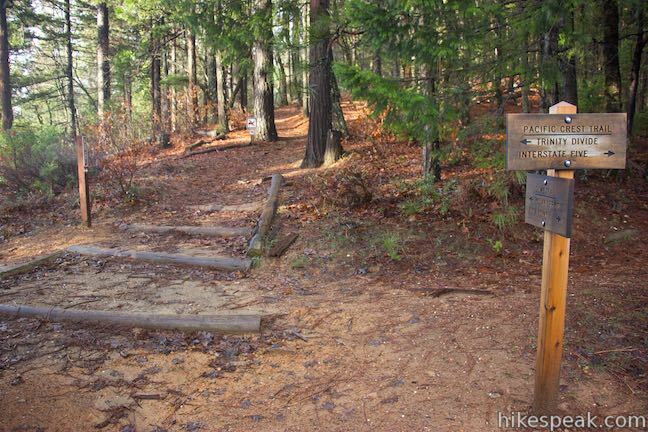 There are 76 developed campsites within this state park that are nestled within a pine forest with access to nearby trails. 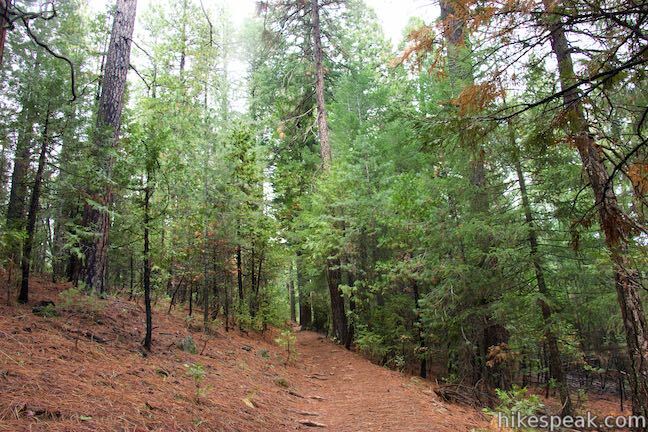 This six-site campground in Castle Lake is shaded by conifers in Shasta-Trinity National Forest. 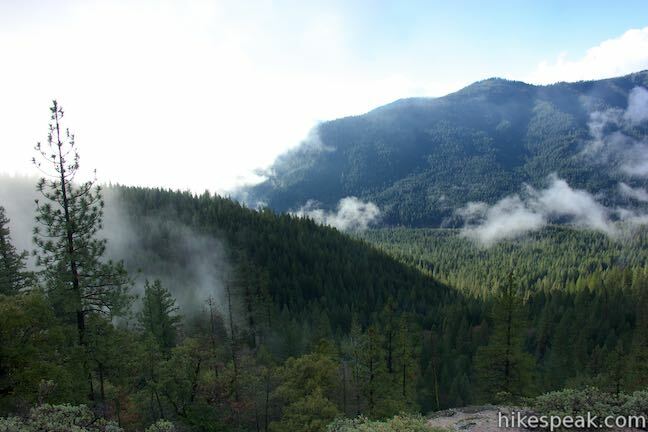 This well-shaded 59-site campground in Shasta-Trinity National Forest has level sites on a bluff next to Shasta Lake. 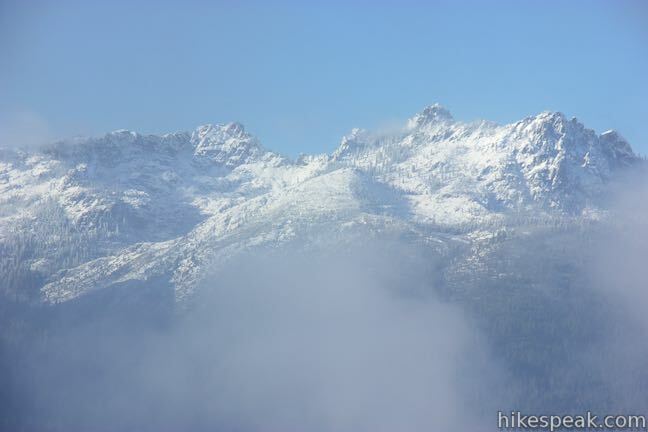 Wow the snow on those mountains is amazing! 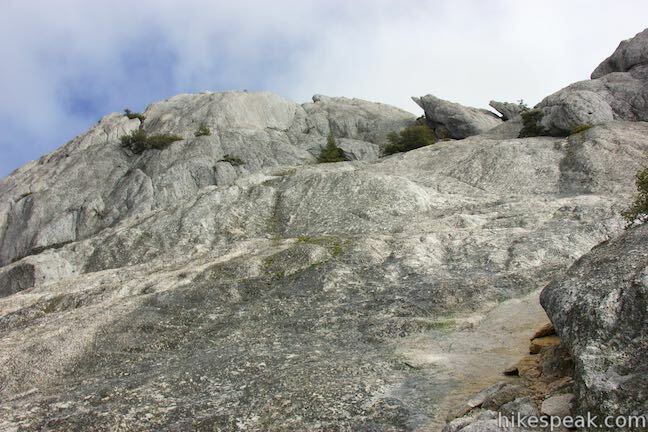 I made the mistake of trying to climb Castle Dome and only made it about 3/4ths of the way before realizing I should not be doing this. 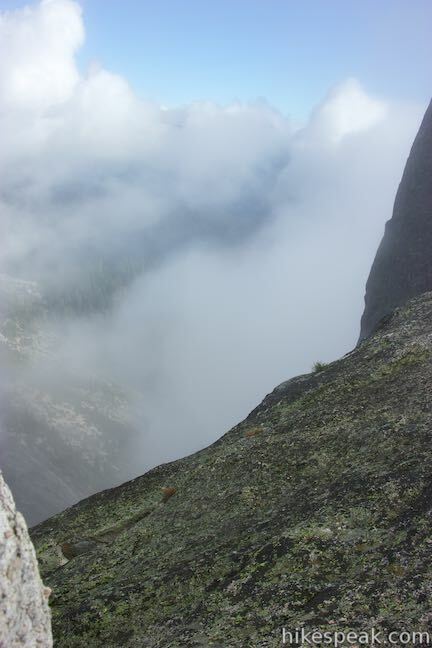 It was very interesting to be up there on a cloudy/foggy day. 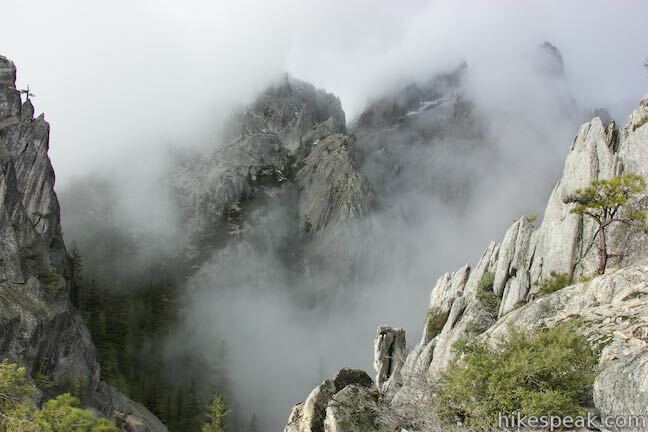 Peaks kept appearing and disappearing. At times it felt like I was only getting a fraction of the views, but the fraction I saw was amazing. 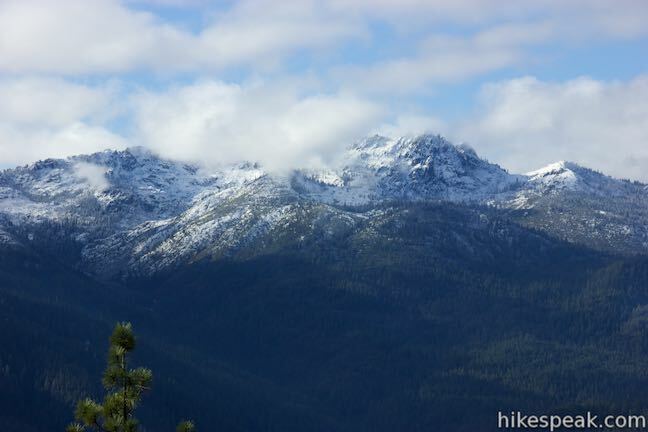 When conditions cleared enough for me to see all the snowy peaks above Castle Dome, it basically stopped me in my tracks. 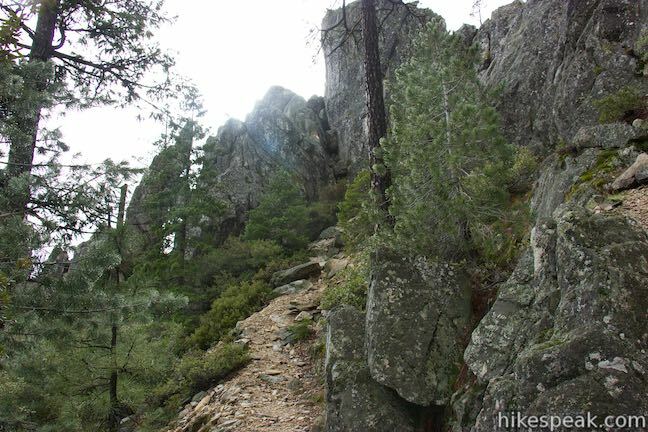 It says no bikes or dogs on Castle Crags.. Is it passable for horses?